If you’re a veteran Mac user, you’re familiar with Apple’s legendary Extended keyboards (code-named USS Enterprise, Saratoga, and Nimitz for their massive size). Fans of these ADB keyboards kept them alive with adapters, prayer, and spit because of their terrific feel and speed. Many feel that Apple’s subsequent keyboards were mushy in comparison. Fortunately, Matias’ Tactile Pro keyboards offered a feel similar to the Apple Extended keyboards. Like these Apple keyboards of old, Matias used individual Alps mechanical keyswitches. These switches require a deeper press than today’s slim keyboards but are responsive, fast, and, most noticeably, loud—as in early-90s loud. Watch a movie or TV show from this era where someone’s typing on a computer keyboard and that’s the sound you hear—clack, clack, clackity, clack. Matias ran out of keyswitches a couple of years ago and so its Tactile Pro 2 keyboard became nearly impossible to find. 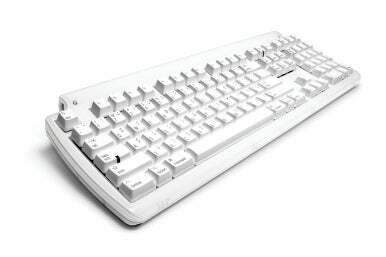 Those of us who loved these keyboards babied them in the hope that we could make them last long enough for a Tactile Pro 3 keyboard to arrive. That day is here. The Tactile Pro is alive again with version 3 (though the first batch is sold out and new ones won’t be available until March). Like its predecessors, this wired USB keyboard uses Alps mechanical switches, is extremely responsive, and is no less loud than the Tactile Pros that came before. Moving beyond the sound and feel of this $150 keyboard, it offers some attractive features. First, it sports three USB 2.0 ports. These ports don’t provide enough power to charge an iPod or iPhone, but they work perfectly well for syncing them. It also has a couple flip-out feet to raise the back of the keyboard if your desk arrangement requires it. This capability used to be a common feature but it’s becoming less so lately. It’s something I appreciate and I’m glad it remains on the Tactile Pro 3. And going against Apple's trend in keyboard design, the Tactile Pro 3 has a keypad; 15 F-keys; a dedicated Eject key; Volume keys; and Help, Home, End, Page Up, Page Down, and Forward Delete keys. I understand that slim is in, but I routinely use the keypad and dislike pressing an Fn key to invoke a key combination when I can type a single key instead. Finally, like the previous Tactile Pro keyboards, the Tactile Pro 3 has alternate characters printed on each keycap. For example, if you’re looking for the ™ character, just look at the 2 key along the top of the QWERTY keyboard and you’ll see that this key can produce 2, @, €, and ™, depending on the modifier key you press with it. You can locate these symbols with OS X’s Keyboard Viewer and other third-party tools, but it’s nice to have them laid out in front of you. I very much like the feel (and don’t mind the sound) of the Tactile Pro 3, but you may not. Things have changed from when the original Tactile Pro and Tactile Pro 2 were first offered. Today’s keyboards are smaller, quiet, have short-throw keys (meaning they don’t travel very far before they hit bottom), and many third-party keyboards include macro and special-function keys (for media control and application launching, for example). As I mentioned, the Tactile Pro 3 is a larger keyboard, is loud, has longer-throw keys, and bears traditional QWERTY and keypad keys. If you’re accustomed to today’s keyboards, moving to a Tactile Pro 3 will take some getting used to. With its old-school action and design you may feel like you’re typing on your parents’ keyboard. If you’re looking for a small, quiet keyboard with a load of bells and whistles in the form of special-function keys, the software to configure those keys, and a built-in track pad, the Tactile Pro 3 is definitely not for you. And that’s fine. Matias has sold out its first run of the new Tactile Pros, indicating that they won’t be available by the palette-load. If you don’t see the charm and utility in a keyboard like this, stay away and leave them for people like me who do.